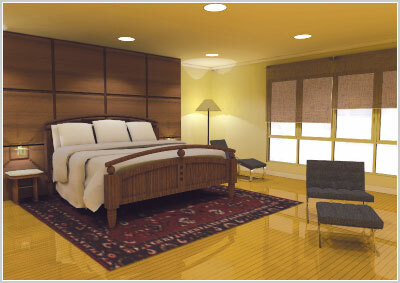 What is the ideal feng shui bedroom? Is it where we find solace, a place to rest, a place for love? Or do we look on the bedroom as the ultimate sanctuary? 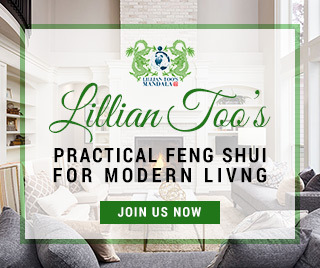 For most people it is a place for all of these things, and since we want so much from our bedrooms, how can we use feng shui to magnify all these aspects of what we want? Chris Yeo examines the design features of a feng shui conducive bedroom. If you are looking for love and romance, consider these do’s and don’t based on feng shui formulas. Using the Eight Aspirations formula, the Southwest is the sector that symbolizes love and romance. So if you are down on love, consider sleeping in the Southwest corner of your bedroom. You also need to enhance the SW corner with love energizers. At the same time, do not forget your sleeping directions according to Eight Mansions. Orientate the bed headboard to your Nien Yen or Personal Relationship direction based on your date of birth. Then enhance the Southwest with the key ingredient of yang energy derived from auscpicious lighting. How? Introduce an integrated lighting design. The use of warm downlights will improve the yang atmosphere, creating an environment conducive for love. Enhance further using decorative lampshades, preferably red textured shades that throw subtle red hues into the overall environment. 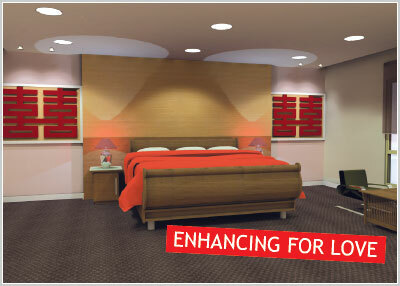 Creating a ‘red’ ambiance in the bedroom sets the tone for an improved love life. This is because the energies of the Southwest come alive with the help of some fire energy. The earth element of the SW gets powerfully recharged this way. Here is an idea for a bedroom for those of you wanting to improve and enhance your love life. Note the understated use of red hues that do not make the bedroom excessively loud. Also note how lighting is being used to create a subtle undertone of yang energy. The double happiness images look artistic and are modern looking. Love symbols such as the double happiness character will also help generate the right launch pad to attract romance into your life. This can take the form of paintings or figurines. 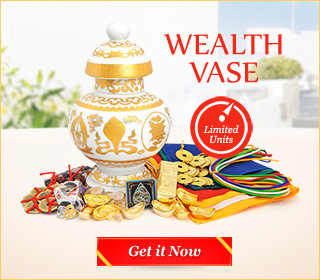 For those looking not just for love but also marriage luck, the dragon and phoenix image can also be used. The balance of colours in the bedroom also needs consideration. In a Southwest earth corner bedroom, use beige coloured walls to create subtle earth tones in the room. Use a solid base flooring with textured earth tone carpets to balance the ambiance. This also creates the base with which to hold together other intricate yang colours in the room. A significant bedroom taboo is never to have mirrors inside the bedroom as this is said to attract third parties into the relationship. But for singles, perhaps it is a good idea to use this taboo to your advantage to jump-start that non-existent love luck! Under Flying Star feng shui, houses that face Southwest 2/3 in Period 8 will enjoy an additional love sector. This comes in the form of the 4,1 mountain and water star, the ideal combination for romance luck. The key enhancer for this star combination is wood energy, but since it is never good to display live plants in the bedroom, you can enhance with shades of green or use wood furniture instead. A wood-based bedroom allows us to play with a multitude of material and lighting choices. Using a wooden headboard for the bed opens up the possibility of multiple wood veneer choices. Other elements of wood can be wood flooring or a solid timber base as the bed frame. In this scenario, it is important to balance the colours. The introduction of natural wood features creates an overall brown-based expression in the room, which is why the use of light natural tones are required to offset this light-absorbing material. Light toned bed sheets enable us to offer a complimentary mix to the overall setting. The use of materials and lighting fixtures can also affect the mood you are trying to achieve. Too much of one thing is never good. Avoid overdoing the lighting or over contrasting the colours and furniture pieces, as this will exaggerate the yang aspect of the bedroom. The use of white walls with a vibrant coloured bedspread might create unsettled energy in the bedroom. This bedroom suffers from extreme yang chi. There is obvious imbalance here which needs to be softened with yin colours, textures and images. Carpets and light furnishings such as throw cushions and pastel headboards are what are needed to create good feng shui balance here. 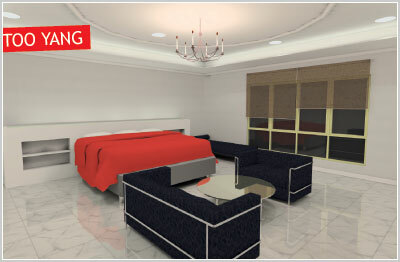 Material and furniture selection plays an important role in setting the mood. The use of extreme yin and yang colours, such as dark-based sofa sets with white stark flooring tiles can create conflict. Yang environments tend to create extreme ‘hardness’ in the room and require a balance of softer tones, either through soft furnishings such as carpets, or an off-tone wall to absorb the stark aspects of the room. Mixing up the lighting with downlights, ceiling washers and chandeliers is another taboo when it comes to designing feng shui for a bedroom. Too many different lights in the room are sure to be overpowering for anyone sleeping there. Similarly, the use of light absorbing materials and inadequate lighting levels can lead to an excessively yin bedroom. Halogen lights tend to create scattered bright spotting across the room, leaving key areas too bright or too dark. Wall and bedside lamps can lift the energy of a room considerably but can only offer so much in setting the colour tone. They cannot create an overall ambiance. here is a major infusion of yang energy, which can be done with clever lighting. The choice of dark toned bedspreads and carpets further absorbs whatever life energy you bring into the room. Even the use of design features to help promote love luck is totally negated by the lack of yang energy. As a result, the room becomes excessively yin. When you design your bedroom, always take note of the principle factor, which is creating an overall ambience that suits you. It is important that yin and yang are balanced. You can use occasional light fixtures to extract specific colour tones required to soften the feel of the room. But balance the overall expression by selecting light-toned wall colours or natural wood panelled walls. This will absorb or reflect excessive ambient light. Select bed styles by balancing the colours used for the bed spread. Avoid colours of the same band such as black on browns, or white on red instead, select colour themes that compliment each other. The use of natural colours offers the widest spectrum of colour choices. The secret to good bedroom design is the ability to balance colours and lighting to achieve a settled environment, whether you want to enhance for love, health or harmony.